We decided to visit Teddy’s Painted Canyon overlook one morning on our drive to the Enchanted Highway and we were not disappointed. The cool wind lifted our hair and the sun painted the red brown rocks in a variety of colors. We hiked down a short path and sat above a martin colony. We ate our breakfast of coffee and donuts and delightedly watched them feed on the morning mosquitoes and gnats gathering at the rim of the canyon. Dozens of dive bombing birds and one of the best breakfast views we’ve had. 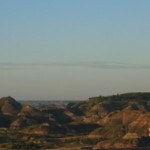 This is a not-to-miss stop on your way to, or from, western North Dakota. More info here. OMG the pictures are amazing, can’t imagine how much beautifuler it had to have looked in person. It was amazing!!! Donuts were good too. Coffee, donuts, those awesome views and each other. What a wonderful start to the day.